As strange as it might feel, YES! You can get dressed right after your tan! I get asked this question every day & I get why! You still feel a little wet & it looks like your smudging the tan all over the place when you start putting your clothes back on, but I promise, your final tan will be just fine! When you see the instant color right after your tan is applied, all you’re actually seeing is a temporary bronzer, not the long lasting tan. The long lasting tan goes on clear & slowly gets darker & develops over the 8 hours after your tan. (That’s why you always look extra dark before you shower.) That actually dries instantly as we tan you. What feels wet after your tan is the bronzer with all the added aloes & moisturizes. As your tan is developing, your skin will soak up the moisturizes, the tan will dry down & the stickiness will go away. When you take your first shower, all of that temporary bronzer is what you see rinse off in the water. When you see the smudges as you get dressed, all you are smudging is that bronzer. The long lasting tan is already set! That’s why you don’t have to worry about those smudges – it will wash off in your first shower & your tan will be perfect! What will mess up your tan is tight clothing. Avoid putting on tight leggings or a bra right after your tan. If something tight is rubbing against your skin & tan while your tan is developing, it may leave tan lines. 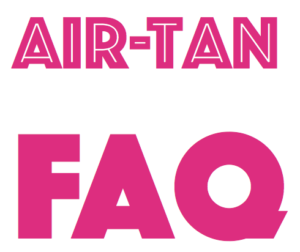 If you have any questions about your Air-Tan’s aftercare or you want to schedule an appointment, just give us a call! Which Air-Tan Package is Best for me?